Join us on September 10th for our Annual Horse Show! Our riders look forward to forward to this day all year long as this is their day to shine, and earn ribbons which bring grins from ear to ear! On this day, participants can show parents, caregivers, friends and the community what they have learned during the past year as people come to support, cheer and congratulate them on a job well done. 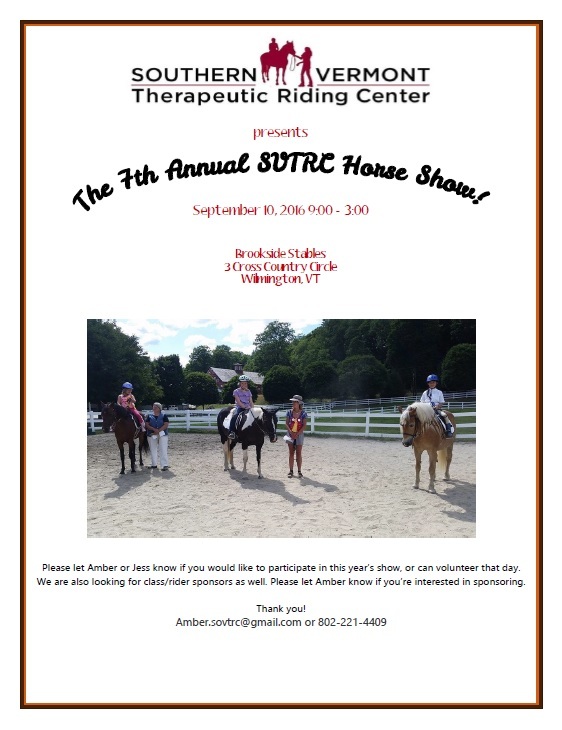 This year, while maintaining the pride and excitement of the event, our Horse Show will also be an Open House for the Wilmington community to visit Brookside and see all that SVTRC and our program can offer. Lunch and snacks will be available for purchase. There will also be demonstrations in driving and more from the riders of Brookside Stables during the lunch break! To help offset costs of this event, local community members (businesses and individuals alike) sponsor classes and purchase ad space in the event program given out to all riders, volunteers and attendees. If you are interested in sponsoring a class, or placing an ad in the show program, please contact Executive Administrator, Amber Thibodeau at amber.sovtrc@gmail.com or by phone at 802-221-4409. All proceeds from sponsorships and ads go towards clients who need scholarships as well as upkeep for our therapy horses. Many clients--young and old—who benefit from SVTRC's programs cannot afford the full cost of lessons. Donations from generous supporters help us provide scholarships – sometimes paying for clients’ lessons in full!